Tier I includes fire districts located in Coventry, fire districts with annual operating expenditures for all funds (exclusive of capital outlay) equal to or greater than $1,500,000 and fire districts with a charter, by-law, or other external requirement to have an audit. Fire districts which routinely have had an annual audit are encouraged to continue with annual audits. Tier II fire districts are not located in Coventry, do not have a local or external requirement for an audit, and annual operating expenditures for all funds (exclusive of capital outlay) is either (1) between $500,000 and $1,500,000 or (2) less than $500,000 but with outstanding debt greater than three times the annual operating expenditures. Tier III fire districts are not located in Coventry, do not have a local or external requirement for an audit, and have annual operating expenditures for all funds (exclusive of capital outlay) of less than $500,000, and have outstanding debt less than 3X times the annual operating expenditures. The below table provides a snapshot of the reporting requirements for Fire Districts by Tier. Please see below for a detailed explanation by reporting topic and the applicable legal requirements per Rhode Island General Law. The below schedules provide a snapshot of the reporting due dates, except for the annual financial reporting due dates which are provided in the Decision Tree below. All fire districts located within the Town of Coventry shall be required to provide for an independent annual audit. The Auditor General shall prescribe requirements for audits of fire districts. Every fire district authorized to assess and collect taxes shall be required to have annual financial statements audited by an independent auditing firm approved by the Auditor General. The Auditor General may waive or modify form and content of financial statements and scope of the audit, based upon the size of the fire districts. The Office of the Auditor General has developed the below Decision Tree to assist Fire Districts in implementing the annual financial reporting requirements pursuant to the recently enacted legislation, House Bill 7944Aaa and Senate Bill 2778aa. The Decision tree should be used to determine the Fire District’s applicable Tier for annual financial reporting. 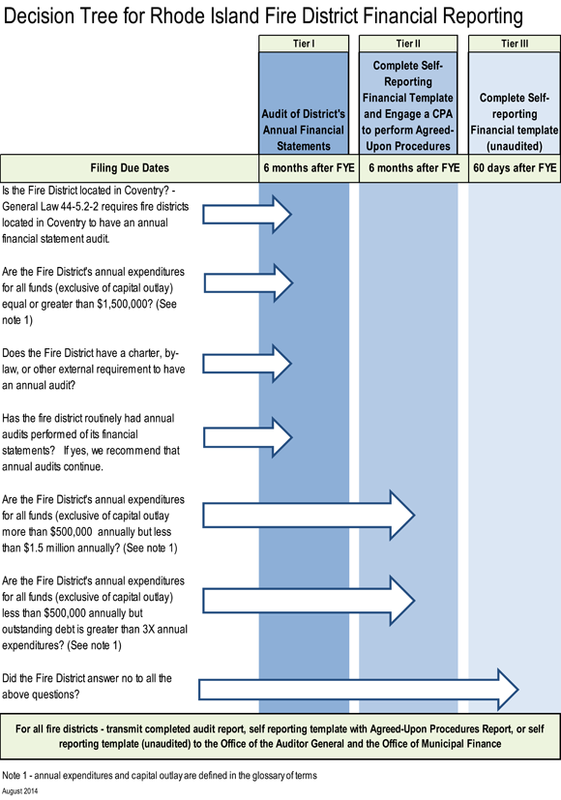 Tier I fire districts must have an annual audit of the district’s financial statements. The draft request for proposals for audit services and selection of auditors shall be subject to final written approval by the State Auditor General. Fire districts shall not engage auditors nor contract for their services until such written authorization is received from the Auditor General. The audit contract may cover one, two or three fiscal years. Each year must be treated as a separate audit and the contract period shall not exceed three years. At the end of the contract period, the fire district must go out to bid for audit services. Annual audits of fire districts shall be conducted in accordance with generally accepted auditing standards and Government Auditing Standards. The annual audits shall be submitted to the Office of the Auditor General and the Division of Municipal Finance no later than six months after fiscal year end. The Auditor General has issued Guidelines for Audit Bids and Specifications for Tier I fire districts in order to provide for consistency in the bidding and approval process and encourages use of the template (Form FD-8) for the fire district’s bid specifications for audit services. Fire district officials should also consult their legal counsel to ensure compliance with state and local laws regarding procurement of services and the issuance of bid specifications. Tier I fire districts are required to submit to the Auditor General a copy of the draft bid specifications prior to the solicitation of bids for audit services and a completed Form FD-5 – “Request for Approval of Fire District Audit Bid Specifications”. Once the fire district has completed the bid process, it must complete and submit to the Auditor General FORM FD-6 - "Request for Approval of the Fire District Auditor Selection” and a copy of the complete response package from the professional firm for which approval is requested. In addition, the fire district shall submit the evaluation grid analyses (Form FD-7 and each FORM FD-7.1) completed on all the audit firms that responded to the request for proposals (RFP), as well as any other pertinent information considered by the fire district in making its selection. Please refer to the Guidelines for Audit Bids and Specifications for further details on the approval process for bid specifications and auditor selection. By approving the fire district’s selection of an audit firm, the Auditor General is not ensuring that the audit firm will (1) meet all contractual terms including the deadline for completion of the audit or (2) comply with professional standards in the conduct of the audit. Approval of a firm to conduct the audit does not limit our authority to review, make further inquiries, and/or reject the audit report. Tier II fire districts must complete the Annual Self-Reporting Financial Template (Form FD-4) and engage a certified public accountant (CPA) to perform Agreed-Upon Procedures. The Auditor General has issued Guidelines for Agreed-Upon Procedures Engagements for Tier II fire districts in order to provide for consistency in the testing of specific reported financial information. Prior to engaging a CPA to perform the agreed-upon procedures, the fire district is required to submit FORM FD-9 to notify the Auditor General and request approval of the CPA selected to perform the services. The fire district will have the option of engaging a CPA for up to three years. Fire district officials should also consult their legal counsel to ensure compliance with state and local laws regarding procurement of services and the issuance of bid specifications for CPA services. Please refer to the Guidelines for Agreed-Upon Procedures Engagements for further details on the specific agreed-upon procedures requirements and on the process for engaging a CPA. The Annual Self-Reporting Financial Template (Form FD-4) with the Agreed-Upon Procedures Report shall be submitted to the Office of the Auditor General and the Division of Municipal Finance no later than six months after fiscal year end. Tier III fire districts must complete the Annual Self-Reporting Financial Template and submit a copy to the Office of the Auditor General and the Division of Municipal Finance no later than 60 days after fiscal year end. The treasurer/chief financial officer or other fiduciary, as applicable, of the fire district shall continuously monitor the fire district's financial operations by tracking actual versus budgeted revenue and expense. The treasurer/chief financial officer or other fiduciary, as applicable, of the fire district shall submit a quarterly report on or before the 25th day of the month succeeding the end of each fiscal quarter to the division of municipal finance and the state auditor general. Each quarterly report submitted must be signed by the chair of the governing body and the treasurer/chief financial officer. The report shall be submitted to the members of the governing body and the members of the town council. The quarterly reports shall be in a format prescribed by the division of municipal finance and the state auditor general. The reports shall contain a statement as to whether any actual or projected shortfalls in budget line items are expected to result in a year-end deficit; the projected impact on year-end financial results including all accruals and encumbrances; and how the fire district plans to address any such shortfalls. If any of the quarterly reports project a year-end deficit, the treasurer/chief financial officer or other fiduciary, as applicable, of the fire district shall submit to the division of municipal finance and the state auditor general a corrective action plan signed by the chair of the governing body and treasurer/chief financial officer, or other fiduciary as applicable, of the fire district on or before the last day of the month succeeding the close of the fiscal quarter. The plan shall provide for the avoidance of a year-end deficit or structural deficit that could impact future years. The plan may include recommendations as to whether an increase in property taxes and/or spending cuts should be adopted to eliminate the deficit. The plan shall include a legal opinion by legal counsel that the proposed actions under the plan are permissible under federal, state, and local law. The plan shall be sent to the members of the fire district's governing body and the members of the town council. Fire districts shall also provide to the division of property valuation and municipal finance in the department of revenue the adopted budget thirty (30) days of final action, and other information on tax rates, budgets, assessed valuations, and other pertinent data upon forms provided by the division of property valuation and municipal finance. The tax levy shall be applied to the assessment roll and the resulting tax roll certified by such fire district's tax assessor, treasurer, or other appropriate fire district official to the town clerk, town treasurer, tax assessor or tax collector, as the case may be, and to the Department of Revenue, Division of Municipal Finance.